Our final day in the Netherlands was spent mostly lazying around Dave and Jelana’s place, although we did manage to get out to Rotterdam in the late afternoon. Why Rotterdam? 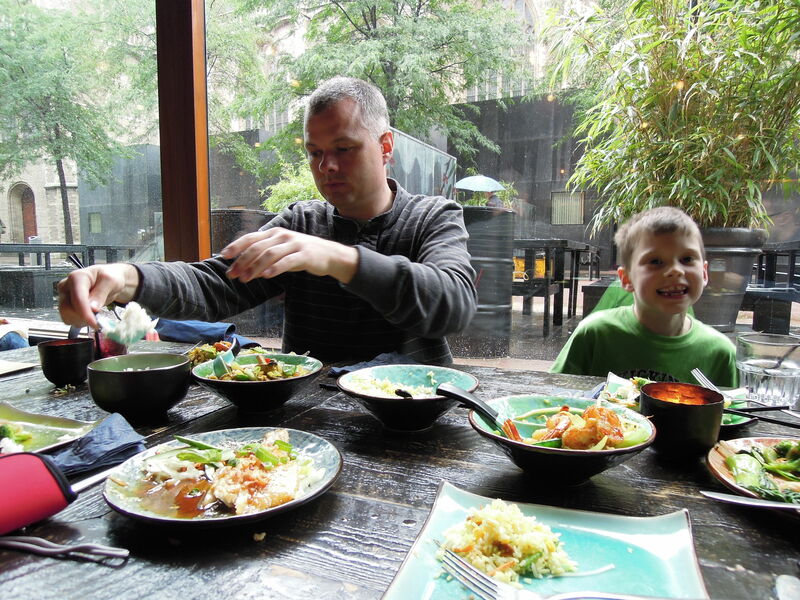 Well, it was rainy and miserable and Rohan has a great place in Rotterdam. We figured that if the rainy, miserable weather continued we would simply hang out there! So off we went, much later than we should have. Our first stop-a posh Vietnamese restaurant called “Vii”-ended up being our first really great food experience of the trip (other than the great meals at Dave and Jelena’s, of course). I’ve never really experienced up-scale Vietnamese cuisine before, so it was really a treat. All of the dishes were familiar, but made with very high quality ingredients and attention to presentation. I loved the salad rolls in particular. They contained some kind of sprouts that had a kick to them…I would guess some kind of radish sprout or something. Anyway, it was a satisfying meal and the kids did well. We wandered over to Rohan’s house next. He is renting this awesome apartment with three floors, connected together with insanely steep Dutch steps. They made Quentin dizzy, so he was happy to stay away from them, although Landon took it upon himself to practice descending and ascending straight away. We decided video games might keep him in one spot. 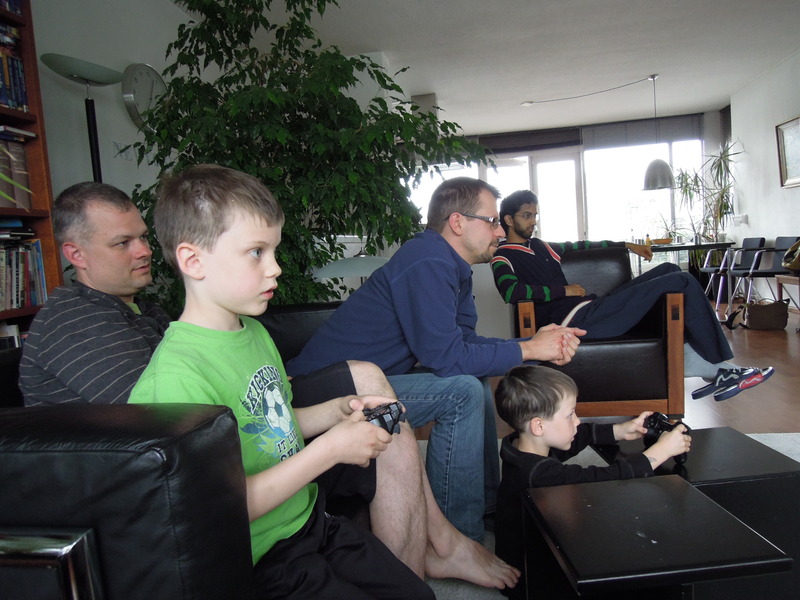 For the next hour or so, Dave, Stephen, Rohan (providing moral support), Landon and Quentin played soccer on the PS3. Not much fun for me, but relaxing. Plus it was nice to see all of the boys playing together so well! We finished up our time in Rotterdam wandering around the old port to see the view and then headed back to the train. We were late, late, late coming home. There was something blocking the track, so we ended up having a quick bite to eat at the train station while the problem was cleared up. We ended up finally getting home at around 10:00, quickly threw the boys into bed, and sat up for some sour-cherry birthday tart with Jelena. At 1:00 am, we thought it might be best to go to bed given that we needed to get up bright and early for our flight to Copenhagen. Landon was still awake (agh!!). Our clocks are all still a little messed up, but Landon is definitely having the toughest adjustment. So! 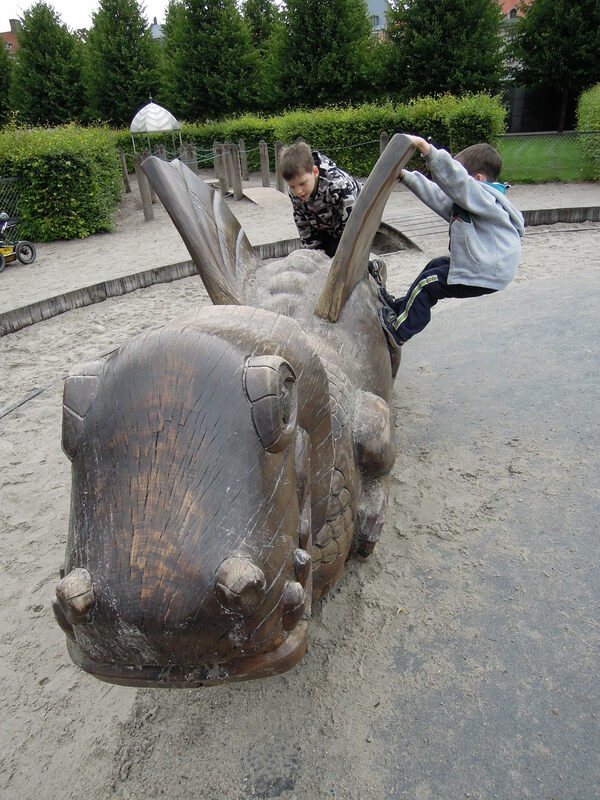 We woke up dutifully before 7:00am, caught the train to Schiphol and were up, up, and away along with a bunch of young scouts from Brazil and Africa. Copenhagen was buzzing with thousands of young scouts from all over the world. We walked right into a big, international scouting jambouree! It looked like a lot of fun, but we were on a mission to get to our apartment. So, through the crowds of scouts we waded and, after a short metro ride and iPad consultation, were at our lovely, eccentric apartment in downtown Copenhagen. None of the floors are anywhere near level. In fact, you must walk down hill to get from one side of the apartment to the other (or uphill depending on the direction). The location is amazing. We won’t have to don wheels for any of our sight seeing over the next four days. Phew! This is what happens when I skip a writing day! Anyway, we only did a short park visit with the kids and got the pair to bed as early as possible so far. Oh…and we had crazy-big hamburgers at a famous Danish cafe. They were the most expensive hamburgers we have ever eaten (about $20 each). We expected the price, but not the huge size, so everything evened out to that nice, slightly uneasy feeling of overspending, but coming out full. There you are! I’ll write again tomorrow.